You’ve never seen a maze like this before. 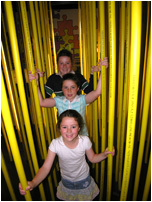 Over 1000 bright yellow tubes vertically suspended to form a special see-through indoor maze. Confused – you have to see it to understand it and you have to remember the path once you’ve learnt it! Work with a partner. Learn the path and race the clock. Compete against other kids to obtain the best time. To make your way through the maze from start to finish. Pass around the vertical tubes which hang from floor to ceiling in a purpose built frame. The tubes are made from heavy-duty plastic to eliminate any chance of injury and to enable easy passageway through the maze. Numerous exit points are available on all sides should children or adults become disorientated. This task center is designed for use by adults and children. Adults can assist the children in completing the maze or time them as they race through from start to finish.